If you’re one of the 75 million Americans who suffer from allergies, you know all too well how your symptoms can make you feel trapped. We connected with Dr. Vivian Hernandez-Trujillo, Pediatric Allergist and Immunologist and Claritin C.L.E.A.R. Council member, to find out more about seasonal allergies, common symptoms and what you can do to help keep them at bay this spring. Let’s start with the basics, what can you tell us about seasonal allergies? An “allergy” is a sensitivity of the immune system to something that is generally harmless. When the body tries to rid itself of the “allergen” (foreign substance), it causes symptoms such as sneezing, watery, itchy eyes, or a runny nose. 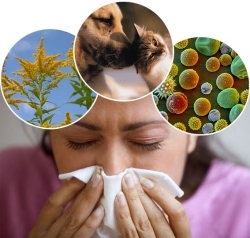 Common allergens include pet dander, pollen, dust mites, and mold. This sensitivity often starts during childhood or adolescence. And although it is not fully understood why some people develop allergies and others don’t, we do know that allergies can be inherited. If both parents have allergies, the likelihood of a child developing allergies is 65 percent. If just the mother or father has allergies, the likelihood of a child developing allergies is approximately 50 percent. What are some common symptoms of seasonal allergies? While everyone’s allergy symptoms may be slightly different, some of the most common symptoms are a runny nose, sneezing and irritated, itchy, or watery eyes. Spring is often the worst time of year for my patients with seasonal allergies, but the reality is people can experience allergies during any season. The summer and fall can also bring about allergy symptoms among some sufferers. The timing and duration of each allergy sufferer’s symptoms truly varies. 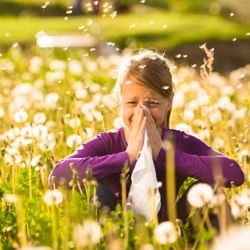 What are some ways people can manage their or their children’s seasonal allergies this spring? You can visit www.claritinespanol.com for more information about seasonal allergies, symptom management and treatment with Claritin. While you’re there, you can also get a coupon to help relieve your seasonal allergy symptoms.